BattleCON: War of Indines is a fast-paced head to head card game for 2-4 players, based loosely around the mechanics and tactics present in 2D fighting games. 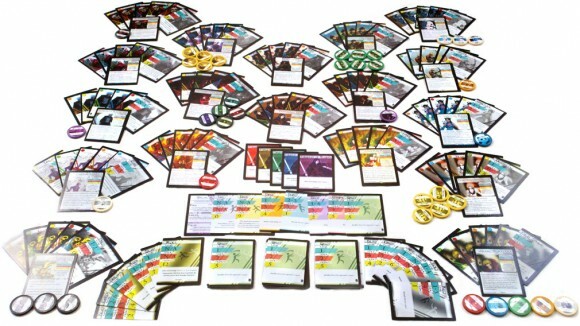 In BattleCON: War of Indines, two or four players choose characters with unique abilities and powers to test against one another in a battle of tactics, strategy, and intuition. While the basics of the game are simple enough that it can be taught in just ten minutes, each character brings a unique combat system and strategy to play that takes many games to master. Each character has 35 different attacks that they combine by creating pairs of cards from their hands. Even though there are tons of options for every situation, a player only needs to manage 8 cards at a time in his hand, making gameplay decisions quick. Every character utilizes a different combat mechanic. These unique abilities aren’t just special effects that come into play now and then–they are different game mechanics that make every character’s experience completely different than the others. One character has custom ammunition that you must use to match the situation; another can set traps to control terrain; yet another can gain levels over the course of combat to become unstoppable, given enough time. Each character utilizes the same foundational attacks, but mixes them up with their own personal styles to create unique strategic maneuvers. Because of this, it is easy to pick up and play a new character right away, but you will still be discovering new tactics and strategies for them with every game you play. A single duel can take between 5 and 15 minutes, and can be set up and put away in almost no time at all. Tom Vasel and Sam Healey provide an in-depth look at the game. Paco Garcia-Jean talks about the game and its components. So, I had heard about Battlecon sometime last year. At the time, I had looked at the game and was a bit torn by it. On the one hand, the premise of the game sounded very nice. A fighting game, different characters, each character playing differently – these are all great things in my book. Then, I looked at the art and was nearly turned off completely by the game. It looked gosh awful in my opinion and it was bad to look at, at least to me.Since then, I’ve played a few sample games of it and I think that is easily one of my favorite games on the market today just by the few samples that I have played. Battlecon is set on the fantastical world of Indines. The setting mixes fantasy with light sci-fi and a little other pop cultural influences to create the setting. Here you have people in armor and using swords fighting with or against guys with guns and so you have the idea that the setting is rather varied and diverse. The game plays as a fighting game between two or more players, depending on what variation or rule set you work with. Each character has 20 life and the objective is to bring them down to 0. You do this by matching your character’s Style cards (cards that reflect the individual techniques and personalities of your character) with universal Base cards (generic techniques that all characters have) to create a unique attack that’s limited to your character. The game takes into account different aspects such as range, stuns, defenses and so forth and so each game can be very different and very interesting, even if you play the same character. I honestly really only have great things to say about the game. The only thing that I really don’t care for about the game is the art, which even now is a rather big turn off for me. The art design is so varied in the game and lacks any real form of consistency. Everything from styling to colors to the inspiration behind the art, there just seems to be no consistency at all. Also, while I think it ends up being ok in the long run, I would have rather had more than a little bit of generic art used for the universal Base cards. Using generic pictures is rather bland and boring, however if we look at it as the idea that they are universal techniques than I feel that its ok since you don’t want to have them isolate single character or two for the attack. Gameplay wise, it was extremely simple and easy to pick up. My wife and I had picked it all up really very quickly and within just a couple of minutes of explaining the game to her we were off and slugging each other. The gameplay is deceptively complex, and you have a lot of tough and interesting choices you have to make in your attacks – something is not easily seen by just looking at the rules or the cards themselves. Also, the characters themselves are interesting and built to be fairly different, so all in all a very good combination of things. Who would I recommend this to? Well, if you are fans of any of the Fantasystrike games (Puzzle Strike, Yomi or Flash Duel) then you may like this game. There are some rather heated debates online as to which is better and people will have their opinion, but I feel the games are very similar in their feel and approach and that’s a good thing. If you enjoy fighting games on a console, then you may like this as well. If you want to try something different and unique you may enjoy this game too. Who would probably not like this game? Well, while there is a lot of strategy involved – I think power gamers may abuse the game to the point where they have their own set of rotations which can create some really tough dilemmas for their opponent, ultimately making the power gamer bored. Also, if you can’t stand inconsistent art work on cards – then this game may bother you as well. Even with that said, I think this game has a great place in any collection. For only like $30 or so you get a huge assortment of characters, making this game giving players a lot of game for a pretty low amount of money. If you are on the fence with this game, then I also recommend going to the website and printing out the PnP demo decks like I had done – and decide if it fits your play style or not. I definitely am digging the theme and the gameplay that’s for sure. As a side note, one of the things I had found by accident is a testing for another game that the designers are working on to some form or other set in the Indines world, the Champions of Indines. Its more of an action, fighting tabletop RPG from the looks of it that I am going to try out at some point, but if you want to look at that you can also head to: http://champions.lvl99games.com/ and check out what they have to test out so far for that game. Again, try Battlecon – you at the very least will not regret it! Add a Review for "BattleCON: War of Indines"